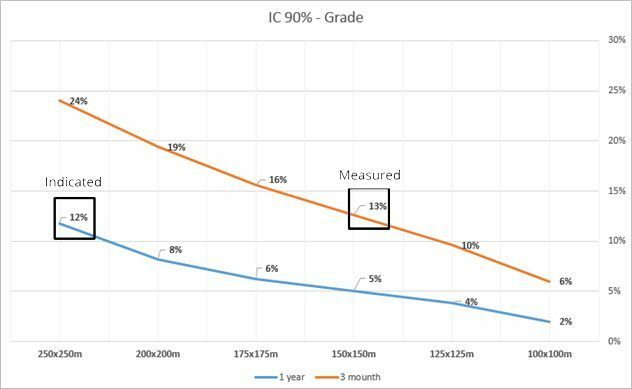 Geovariances’ consultants recently ran a study for a top-ten Aluminum producing company to help them optimize their drilling pattern to achieve different levels of confidence in resource classification. Conditional simulations were implemented for that purpose. The study demonstrated that reliable resource classification can be performed with only 75% of the holes the company is used to drill, it results in a money saving of 25% for drilling campaigns. How to assess the relevant quantity of holes required for a resource classification you can be confident with? This is the kind of question Geovariances had recently to answer. Conditional simulations in Isatis are the solutions, providing a relevant and practical answer to resource classification. Indeed, simulations enable the generation of multiple realizations from which a risk level can be assessed. Different attributes might be simulated considering where the main risks are: grades, thickness, proportion of ore, density, contained metal, tonnage, etc. The simulation variance is computed for each attribute within a production volume, usually on an annual and quarterly or monthly production increment basis. It allows assess local and global estimation uncertainty related to various drill hole spacings and production volumes. It provides an indication of the risk related to the existing or planned drill hole patterns. The result can be used as a justification for additional drilling, to decrease the amount of infill drilling, or simply, to confirm the existing drilling pattern. This sort of study can be fully completed with Isatis without having to use third party software packages. It makes use of Isatis Journal Files, so the whole process is recorded and fully auditable. It also implements the Simulation Reduction approach to identify the most representative subset of simulations. Conditional Simulations are a best practice for uncertainty and risk assessment in mineral resource estimation and are recommended by public reporting codes. Lastly, conditional simulations are performed on each virtual input dataset in order to compute the dispersion of different simulated attributes within a confidence interval of 90%. This methodology indicates the level of risk associated to each attribute. It is then possible to assess the uncertainty (risk) related to each drill hole spacing considering different production volumes. Computed curves below show how the risk decreases as the number of drill holes increases and the impact of the different production volumes (1 year and 3 months). In this case, a drilling pattern of 150x150m is enough to classify mineral resources as Measured and a drilling pattern of 250x250m is enough to classify them as Indicated. Comparing these values to the drilling spacings currently set up by the company, only 75% of the total number of holes they are used to drill are required for a reliable resource classification, which will result in a money saving of 25%.